The Muvattupuzha-Kottayam MC Road, which got a total makeover, has turned into an accident zone. KOCHI: The Muvattupuzha-Kottayam MC Road, which got a total makeover, has turned into an accident zone. In September itself, the stretch near East Maradi saw around nine fatal accidents. According to Sameer Siddiqui, NSS programme officer, Govt Vocational Higher Secondary School, East Maradi, accidents are happening due to the unscientific construction of the road. “The road is smooth like the surface of a mirror. When you drive, it is like gliding on a sheet of ice. So, one can imagine how dangerous that can be,” he said. With no humps to check the speed of the vehicles, the road has turned into a gleaning zone for the God of Death. “The curves on the roads have been built by breaking all the laws of Physics. Where there should be a slight rise in curvature it is flat, in some places the curve is very wide while in other areas there is no space at all. All this contribute to fatalities,” he said. A survey was recently conducted among the residents, shopkeepers, people’s representatives and authorities, said Sameer. “The report is being prepared and will be out soon. We have been asking the authorities concerned to look into the issue. But they are very slow in responding,” he added.According to a teacher of the school,the students are forced to see shattered vehicles and mangled bodies nearly every day. So this National Postal Day, the students took it upon themselves to attract the attention of the higher-ups. 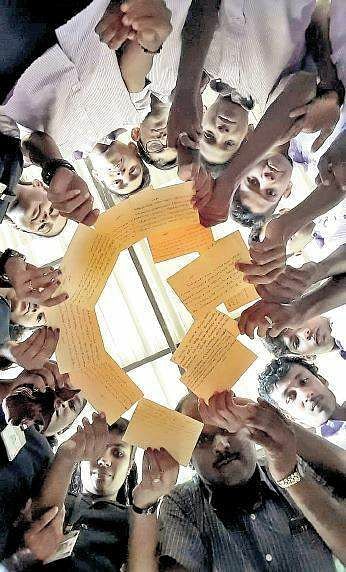 They sent 101 letters to the PWD Minister G Sudhakaran. The students belonging to the NSS unit and other clubs in the school visited the Muvattupuzha Head Post Office and wrote letters to the minister asking him to launch a probe.